Captain America and Wonder Woman’s Jet? 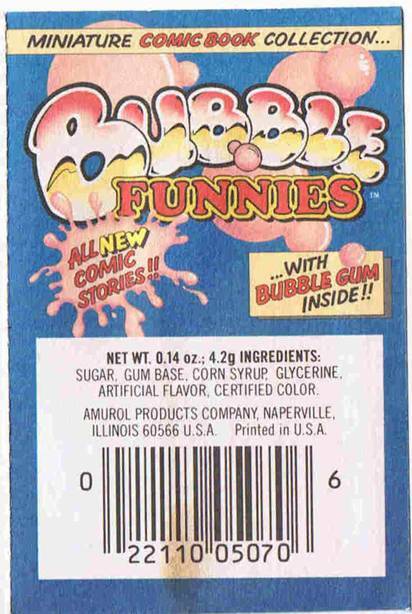 Anyone out there remember when baseball (and other) sports cards came packaged with a piece of gum? Seemed like a brilliant piece of business by the candy manufacturers to get as much cash out of kid’s pockets as they could. When I was a youngster I’d plop down my quarter for a pack of 5 cards and a piece of pink, rock hard gum that would always cut my cheek when I bit into it. Nothing says “fun” like the taste of your own blood, right? Still, getting that coveted Vincent Trembley rookie card was well worth it. The irony here is that, over time, the gum would eventually be dropped because it ruined the cards, not the kid’s health. See, the slightest bit of moisture would soften the gum enough so it’d get stuck onto the card inside, ruining it. Of course, back when kids messed around with their cards, sticking them in spokes and tossing them at walls, this wasn’t an issue. However when folks started to, say, pay $1000 for a really nice Wayne Gretzky rookie card, well, the gum got kicked to the curb. So there you have it kids, the comic book companies got the brilliant idea that they, too, could sell lethal shards of pink confectionary to the public as well. I can only presume this as it has a very big UPC code. Mmm, certified color – what the heck is certified color? It’s kind of frightening to think of, but if the gum wasn’t pink originally, what color was it? That brown smudge isn’t a very encouraging sign, though. 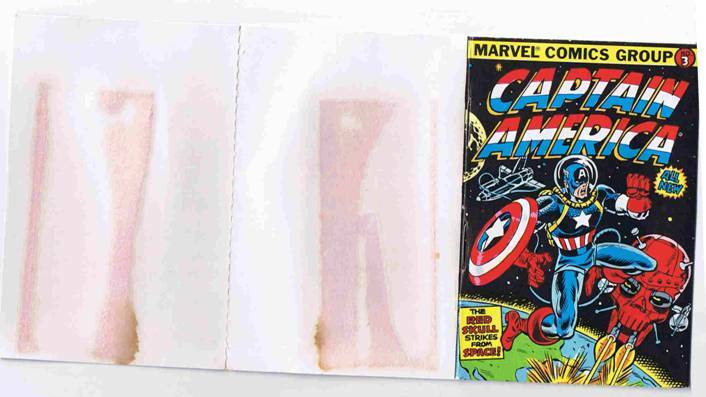 The back cover was made of slightly stronger card and could be unfolded, to reveal lovely pink and brown stains. Seems even plastic sealed mini-comics contain enough moisture to get the gum working. I won’t subject you to the horror image of the actual gum itself. Suffice it to say, seeing a wad of pink and pooh brown gum stuck on a piece of paper isn’t on my highlight reel of life moments. Okay, one quick visit with the mouthwash and we’re good to go. I’m sure you’re here for the comic itself, so let’s see what Captain America has in store! To date this issue you can note that Nick Fury is allowed to smoke in a government building and the oval office was still in its horrible canary yellow décor phase. 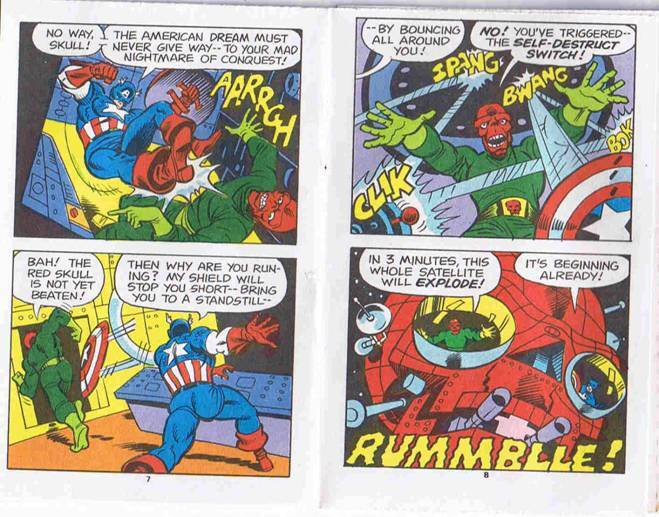 The Red Skull WIPED OUT AN AMERICAN CITY!!! Wonder what city it was? Des Moines, Iowa? Can’t be New York, or you’d see Spider-Man or some other Marvel character getting the heck out of there. Or not. 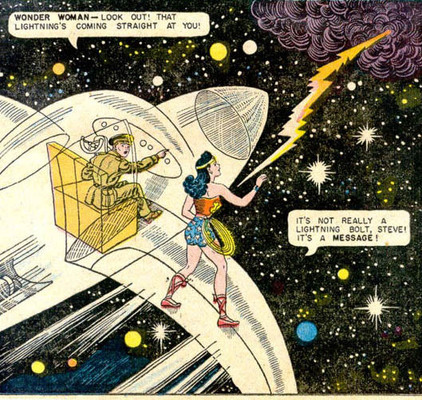 Man, Wonder Woman must’ve been pissed. Well, let’s continue shall we? 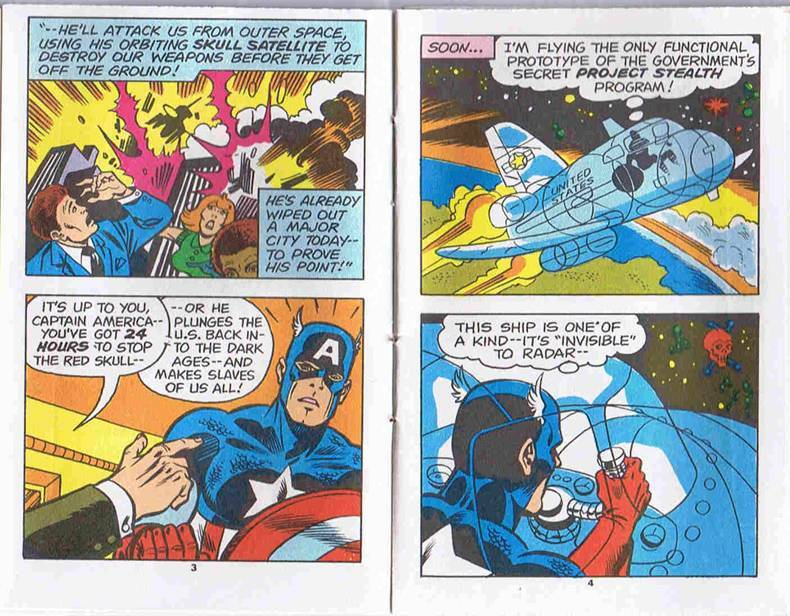 You know, I really don’t understand how the Red Skull could shoot down EVERYTHING the USA would launch at him, especially if they had the stealth technology for a plane that practically landed at his doorstep undetected. Why not just use the same technology on a rocket, or make the plane ram into the satellite, and save Cap the trouble? 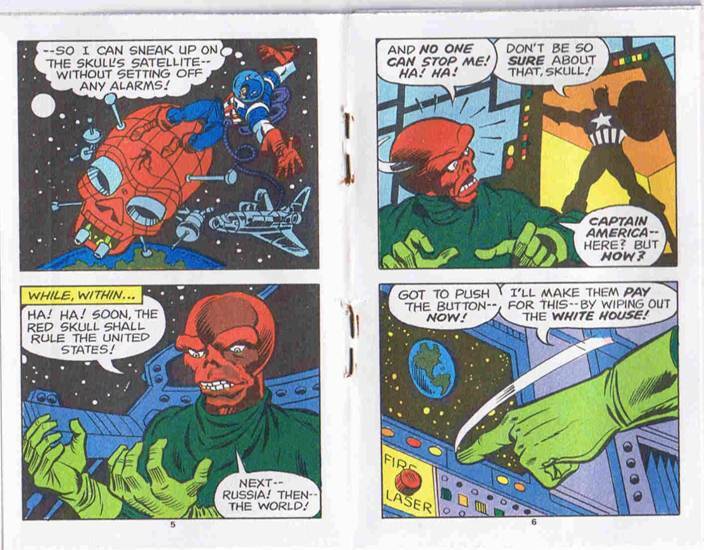 Point number two, I know he’s in outer space and all, but doesn’t the Red Skull believe in security measures? Point number three, isn’t the Red Skull German? Why would he have all the equipment on his satellite clearly labeled in English? 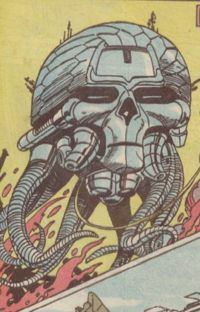 Hey, look, it’s Brainiac’s skull shaped space ship! 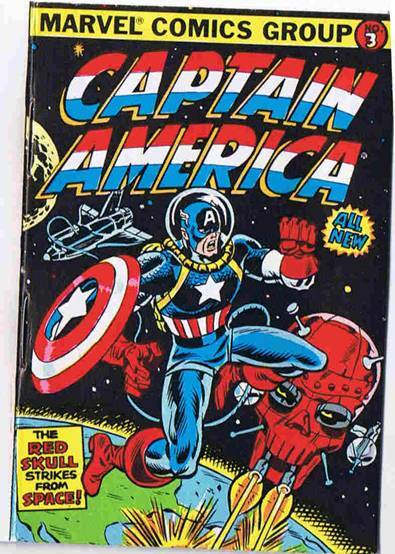 To be fair, I think the Red Skull satellite came first, so shame on you DC! 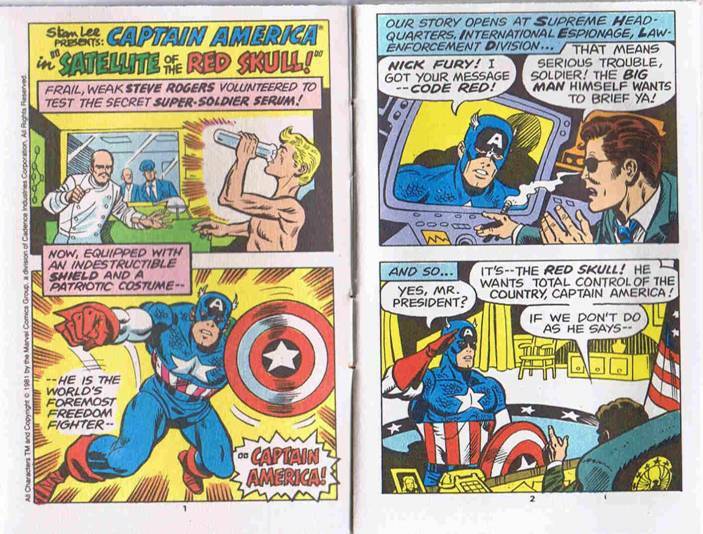 Why in the world did the Red Skull build a self destruct switch? Satellites are very expensive to build (and how did the Skull manage to get it out into space and set-up without the USA noticing for that matter?) and they require meticulous planning, so he must’ve put one in for a purpose. And why the oddly specific time of 3 minutes? So many questions, so little answers. Will Cap get out alive? 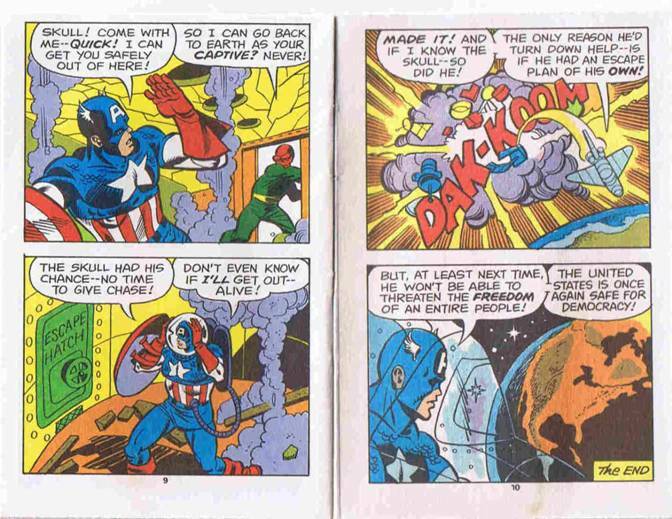 Well, no actually, he dies in space saving us all, making this the first ever death of Captain America issue. I’ve put it up for sale on eBay, starting bid is $50 US. Yeah, I’m a filthy liar. And there’s a nice, English labeled escape hatch for Cap too. In a random thought, there was another rather dramatic incident that occurred in 1981. Perhaps, shortly after his election and while recovering in hospital after an failed assassination attempt in 1981, Ronald Reagan was given this issue as a gift, and he got so spooked by it that the Star Wars program was born. Because he doesn’t. The girls don’t even notice him. Guess he was smart enough to keep his mouth shut, unlike our friend who crossed paths with Supergirl. I’d like to think that someone came across the little Image I’d posted earlier and was inspired to include this in Powergirl, but I’m not that naïve. It’s a freaky coincidence, I know, but still, you ROCK Amanda Conner!